Day 15 – Come in! Come in! Today’s challenge :Day 15- Post a poem (written by someone else) that you love (for any reason). Do you remember the anthology Where the Side Walk Ends? It was my first intro to poetry and I fell in love. The poems were funny, thoughtful, short, long, engaging, and written just for me. At least, that’s how I felt. Invitation continues to be one of my very favorites. 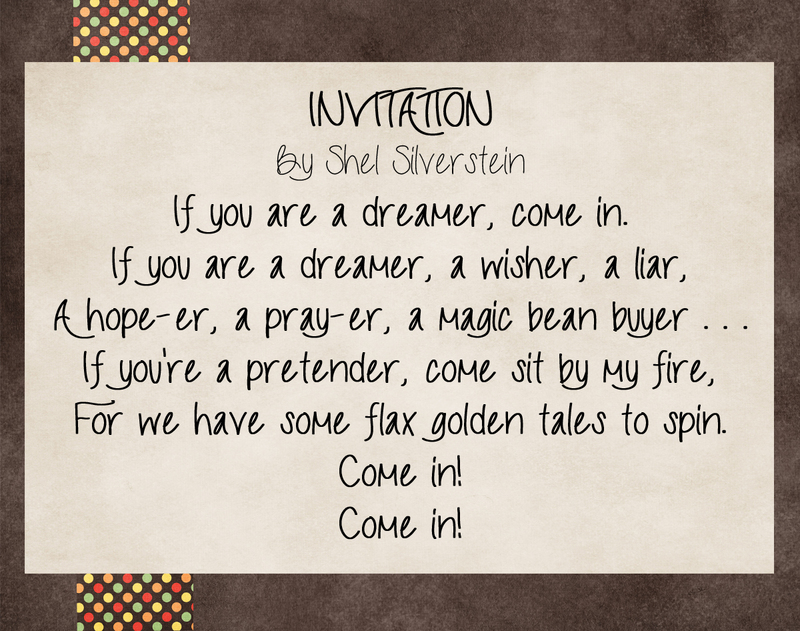 The poem draws you in with its invitation. When I read this poem, I feel wanted, needed. It creates a desire in me to be creative and tell my tale. I’ve shared this poem many time with my little writers in my classroom. This poem was an invitation for them to be themselves and write their own story. Now, I’m trying to do the same.